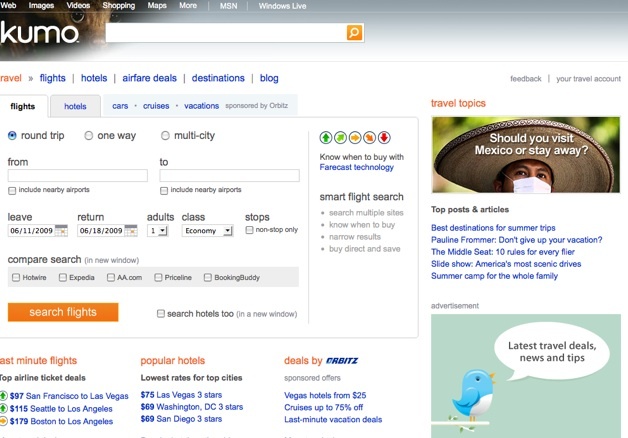 Today, Microsoft publicly unveiled its soon-to-launch search engine Bing. It will become available over the next few days, and be fully launched by June 3. On the surface, Bing has a distinct gloss. The home page features a rotation of stunning photography, for instance, which can be clicked on to produce related image search results. But the most significant changes are under the covers. “We have taken the algorithmic programming up an order of magnitude,” says Microsoft senior vice president Yusuf Mehdi. 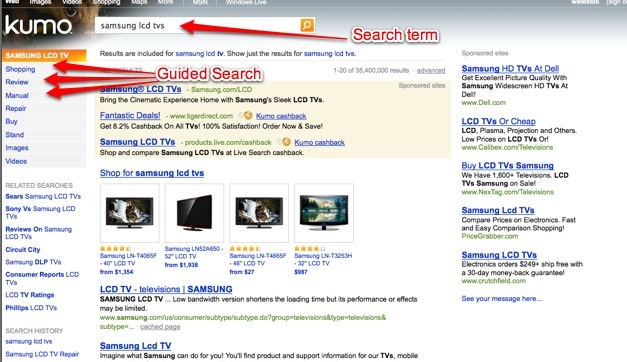 Each search result page is customized according to what type of search you do (health, travel, shopping, news, sports). The algorithms determine not only the order of results on the page, but the layout of the page itself, concluding what sections appear. These sections can include anything from guided refinements and a list of related searches in the left-hand pane to images, videos, and local results. 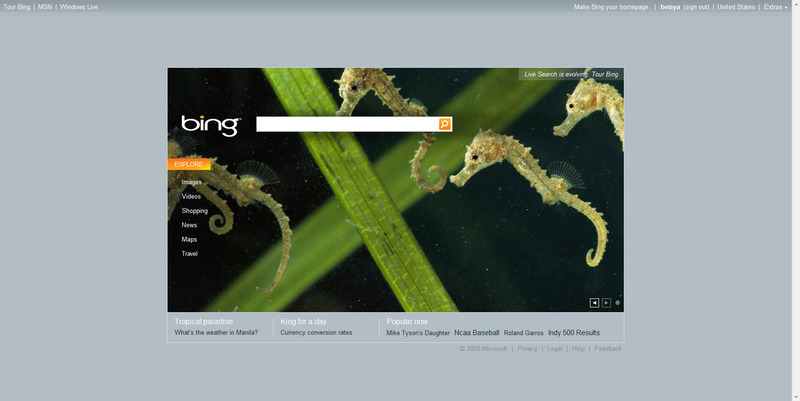 I’ve been playing around with a preview version of Bing for about a week. It is designed to be “more of a decision engine,” says Mehdi. 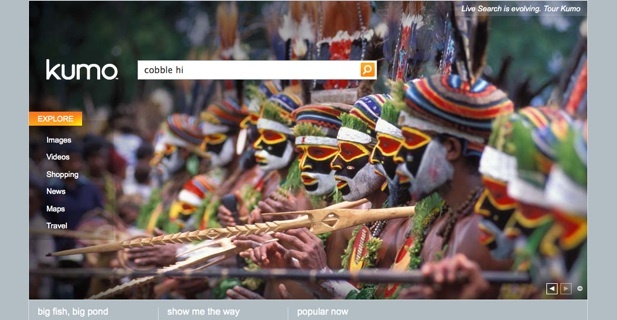 Bing helps people make decisions through guided search and a focus on task completion. In a time when a new Website is created every 4.5 seconds, information overload is becoming a real problem. ” People are getting hundreds of thousands of links but not getting what they want,” says Mehdi. 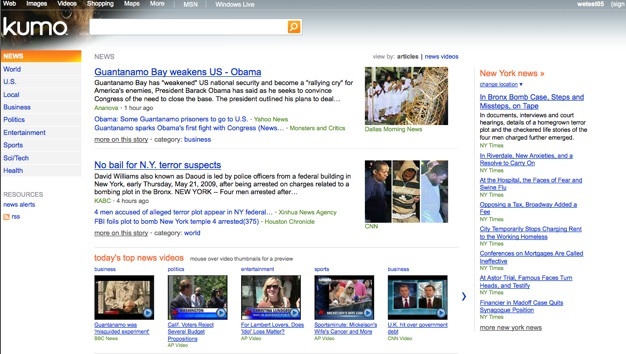 Bing tries to alleviate problem by offering up different experiences depending on the search. It also acts more like a destination site for certain searches. Travel and product searches bring in comparison pricing, reviews, images, and more. Hulu videos can be played within the video search results. Bing pulls in data from other Web services when it can so that you often don’t have to leave to get the information you want. The internal codename for Bing is Kumo (which is what you see in the screenshots), and the current release is called Kiev. 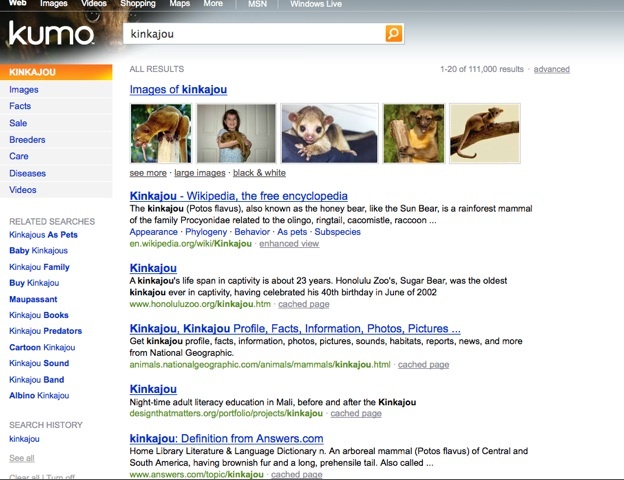 Rather than a spare, blank screen, Bing’s homepage surrounds the search box with a single beautiful image, such as the one of the tribesmen above or a kinkajou. You can hover over parts of the image to get factoids about the image or click through to an image search result page to explore more. 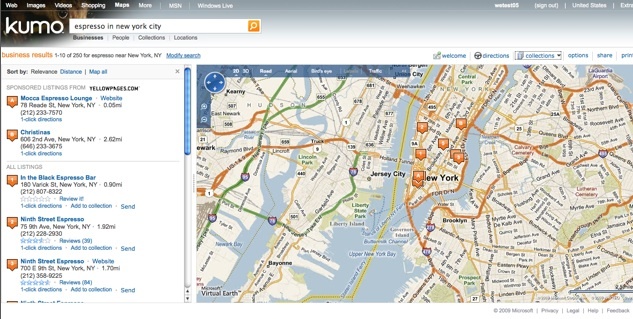 The left-hand pane offers the option to narrow your search on images, videos, shopping, news, maps, or travel. Each of these has a different look and feel. A travel search will turn up a page based on Microsoft’s Farecast technology asking you where you want to go, with flights, hotels, and destination information. A news search offers up headlines, photos, videos, and local news in a column on the right. A shopping search will bring up products and is tied into Microsoft’s Cashback program. Bing also takes advantage of Microsoft’s acquisition of Powerset to provide better previews and snippets of text when you hover over a result. Also, whenever a search brings up a “reference” tab in the guided exploration pane, clicking on that will bring up an enhanced Wikipedia article with semantic tags. Onstage at the D7 conference, Steve Ballmer acknowledges: “There is no way to change the whole game in one step.” But search “deserves a good feature war.” And Bing will be rolling out new features as it goes forward. But is it enough to get people to switch? Bing is certainly not a game-changer, but it does cut out a lot of the back and forth that happens with so many searches today. If Bing can help people find what they are looking for faster, it will put pressure on Google to keep advancing the ball as well.